Bits & Scraps Of My Life: Cards For Emily Blog Hop Day One!!!!! Cards For Emily Blog Hop Day One!!!!! I won't even begin to tell you why I am so late getting my post up!!! How bout we just say the dog ate my homework????? Yeahhhhhhhhh that didn't fly back in school either!!!! If you came from Suzanne's blog then you are in the right place! If you just happened across my blog and are interested in the entire hop and Emily's story, start back at Michelle's blog at Scrappin' For Kenzie! For this hop all we ask is that you hop through the list, then when you are done, link up your card for Emily at Scrappin' for Kenzie. 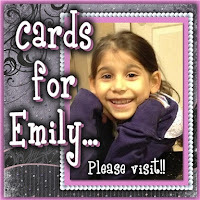 The link up tool is in the left hand side bar under "Cards for Emily". You will see her picture right above it. I always struggle with cards. Do not even come close to considering myself a "cardmaker". I'm getting better tho! I wanted something bright and cheery for Emily, but I don't really have a lot of girly type papers. I have a pad from Me & My Big Ideas called Celebration that has some fun pink in them, and even tho it is really a Birthday themed paper pack I thought it would make a cute card. 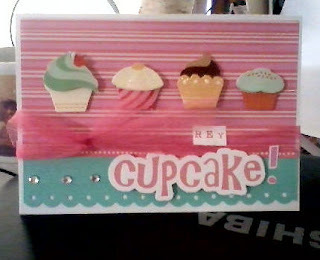 Plus I had some adorable little dimensional cupcake embellies I found at Big Lots from American Crafts Remarks. 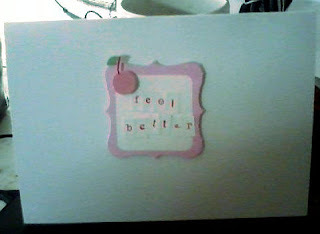 I also used the tulle ribbon from Precocious Paper and the tiny type kinda letters are from My Little Shoebox. Again, I apologize for the photo quality!!! Happy Scrapping! Hope to see you again tomorrow! Wow Tina! For not being a card maker or having any girly paper this card came out perfect! And totally adorable! Since it issss so cute I guess I can forgive you for being so late ;) Thank you sooo soo much for being a part of sending cards to Emily! These are ADORABLE!! Loving those cupcakes! Yummy yummy cupcakes. Love the colors and paper you used. So pretty! Adorable card! Love those cupcakes, that paper is awesome, your sentiment is perfect-looks like you are a card maker to me! Great job! !